Do you purchase fabric online? I sure do. I look for excellent selection and superb customer service. And that is why I'm thrilled to have Randi here today, sharing the background on both her blog, i have to say..., and her etsy shop, Fresh-Squeezed Fabrics. How did you choose the name for "I have to say..."? When I first decided to start a blog, I wasn't crafting or sewing at the time (it took me a while to discover the wonderful world of craft blogs) so the blog name I chose was more about "me". A friend of mine had noticed that I often used the words "I have to say" when I was summing up something that I was saying, so it seemed a fun name for my blog. At first my blog was more about books and homeschooling and exploring ideas, so in a way the name fit better back then. Now my blog is more geared towards crafting, family and whatever I am doing at the moment, but I do think it still fits. It's kind of funny to think that when you start up a blog you pick a name that will stick with you, most likely for a long time, but it's not until you start blogging that you realize the direction things will go. I suppose it's that way with anything in life, right? Hmmm...the other names I picked seem rather silly now! One idea was "A Room of My Own" based on Virginia's Woolf's essay and the idea that a woman needed space and freedom to create. Although I agree with and like that idea, that name for a blog seems a little lofty and I am glad I didn't choose it. Also, I considered "The View From Where I Sit". That one makes me laugh now. I guess at the time I was very interested in my blog being a place for me to create, express myself and be heard. All of those are good things, of course! Now that you are recognized by "I have to say...," are you happy with it, and do you wish you could change it to something else? 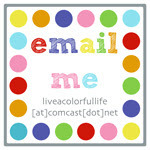 I am generally happy with my blog name, but I do occasionally wish I could change it to something more "crafty". "Seams to Me" would be a good blog name, and I do realize that it is just a crafty version of the name I already have. I also wish it matched my shop name a little bit better, but at the time of starting my blog, I had no idea that owning a fabric store was in my future! I have purchased a lot of fabric from Randi, and the thing that never fails to impress me is her excellent customer service. Lots of times she will receive an email from me, asking for a custom order, something like this: "Randi, could you make a custom order for 1/2 yard of all the dots in the 'Ruby' line." She pulls it all together and sends me the link. So, Randi, how did you choose the name, Fresh-Squeezed Fabrics? 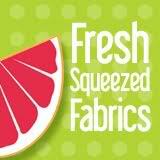 The name Fresh-Squeezed Fabrics came from, well, my imagination. I was dreaming of opening a shop, and I was sitting around trying to think of what I would name it, and Fresh-Squeezed Fabrics popped into my head. It seemed fun, modern and "bouncy". By bouncy I simply mean rhythmic. My other ideas were Candy Shop Fabrics (too childlike), Shadow Mountain Fabrics (kind of boring), and Fresh Cut Fabrics (too close to the name of Heather Bailey's collection). Now that your shop is recognized by Fresh-Squeezed Fabrics, are you happy with it or do you wish you could change it to something else? Fresh-Squeezed Fabrics seems fun to me, although I do find myself having to explain the name quite often--mostly to men. The shop name says "fresh, modern, and new" to me. Kind of like a fresh-squeezed glass of lemonade. Please go to Randi's blog, say hi and spend some time looking around. And then be sure to check out the store too. You will definitely find something to add to your stash. Want to add some Ruby to your stash? Is there a phrase that you say a lot? Mine is: "Here's the thing...," which actually would be a pretty good blog name, too. Or What is your favorite fruit? Mine is a toss-up between fresh raspberries or those yummy fuyu persimmons that are finally available this time of year--the ones you can eat like an apple. Soooo good. 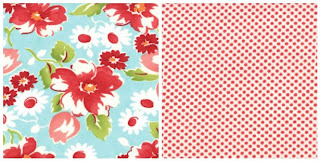 Answer one of the questions for a chance to win four Ruby fat quarters, generously donated by Randi, from her shop. Random Number Generator will choose the winner on Wednesday, 11/9, at noon PST. Randi, thanks so much for playing the Name Game this week! My favorite fruit... local Macoun apples in the fall, picked fresh from the orchard-- they are crunchy and tart. I could eat them every day. Thanks for the post about Randi and the fat-quarter Ruby giveaway! My favorite fruit, Strawberries, hands down. Love the taste of spring!! 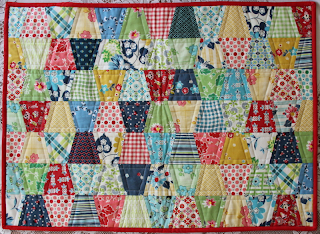 I love Fresh Squeezed Fabrics, and I guess I didn't see that she had a blog, but I am following her now. Thanks for the chance to win some Ruby. Love that fabric! I like pineapple - not to eat every day, but as a special treat. I love it cooked with ham or on a pizza too! I go in phases with my favorite fruits and favorite phrases. . . Right now I'm loving fall fresh apples! Thanks so much for the giveaway chance. I love FreshSqueezed too! Love this fabric line. Great giveaway! Raspberries, or maybe cherries, are my favorite fruits. Great interview and I love her shop as well. My favourite fruit is Saskatoon berries, which are grown on the Canadian Prairies; similar in shape and colour to blueberries,but a tad tarter in flavour. It so nice to get the background of cool blog titles. Thanks! My favorite fruit are raspberries, although I do love all berries and most summer fruit. Thanks for a chance to win some Ruby. Love it! I would have to say my favorite fruit is strawberries. So beautiful and so tasty. I love, love raspberries and eat them year round, followed by blueberries. And Fresh-Squeezed Fabrics is a wonderful shop - great customer service! Well....my favorite fruit would be raspberries! And I always find myself saying, "it is what it is". But...I have to say, that mini tumbler of Randi's is absolutely the best little tumbler ever! How fun to see my good friend Randi featured here today! We have been blogger friends for several years, so I love to see her amazing blog and awesome shop being showcased. We have a lot in common, especially our love of our converse shoes. I love ordering fabrics from Randi's shop because she ships so fast, and she always has a great selection. Yay Randi! PS - my favorite fruit is raspberries, especially since we have our very own raspberry patch now... something I dreamed about having as a little kid. This is easy for me-I always say,"It's all good!" And I love lemons-smelling them, in my beverages, on my fabric! Thanks for the chance to win. Love almost all fruit, but I think I would say that apples are my favourite. Portable & easy to eat...and so many delicious varieties! 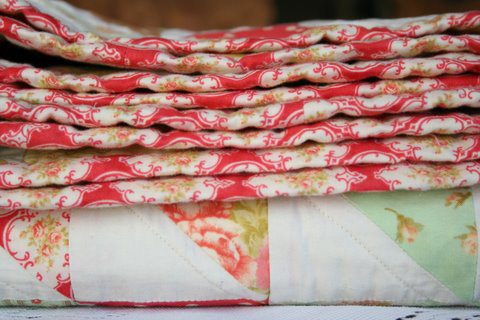 Love Randi and Fresh Squeezed Fabrics!!! My favorite place to buy online. "Let's talk nicely with our sweet voice.". Seems to be my current most often repeated phrase. I am hoping the need will pass soon!!! My favorite fruit are the clementine tangerines, they are like candy! "Is it kind, is it true, is it necessary" is the current mantra in my head. It currently rules my mouth. I often find myself saying "TIMOTHY AND LILY!!!!" at the top of my lungs. Does that count? As for a favorite fruit...blueberries. I adore Ruby and I enjoy Randi's blog too! Thanks for featuring Randi! This is great to know! It's always interesting to read the other options that are discarded. My favorite fruit would have to be raspberries, but there are many that I love. I have two favorite fruits. I could eat anything and everything with pineapple and mango. I'm sure I have a saying that I use all the time, but I have a 3 year old boy full of energy and everything I say to him I repeat like 3 more times! "Miles, get off the floor." What? "Get off the floor." WHAT?! "Get off the floor!" :o) Thanks for the chance. I really like watermelon, but it needs to be ripe. Thank you for the chance to win. Don't include me on the giveaway, but it looks as if your computer woes have been solved. Triple yay! And I love that you featured Randi's blog and shop. My very first online purchase was at her Etsy shop: two yards of fabric and a bag pattern. I've made the bag pattern umpteem times and have continued to order from her. Her blog is also fun to read--it's fun to see a favorite on your blog name post! I'm so glad you chose to feature Randi on your blog! I've been buying fabric from her for more than a year and agree with all you said about the terrific customer service. Since she lives less than an hour from me, I even got to peek inside her "shop" once when I was visiting her town her in Colorado. Oh -- I'm always saying "Peace, Love, and Happiness." Good blog name, don't you think? Is chocolate a fruit? No? OK, it's a tosss up between watermelon and apples. Both would be excellent dipped chocolate! And yes, Randi has the best customer severice EVER! She has helped me with combinations and they're always perfect. My favorite fruit is Strawberries, freshly picked right from the field :-) I'm looking forward to February when the Strawberries will be ripe for picking here in Florida. I love raspberries and cherries! My favourite fruit is raspberries! I've purchased fabric from Randi many times and she's wonderful. I love her blog too. Especially when she does the links to things she's found she likes. i love a fresh ripe pear. OMG, when cherries are in season and they are reasonably priced, I could live on them! Then there are strawberries when they're in season, peaches from a stand on the side of the road, nectarines when they aren't as hard as a rock at the grocery, cantaloupe from vintage seed, and I could go on. I hate winter because fruit seems to go downhill for a couple of months, but I try not to complain because there are so many options the rest of the time! Rasberries followed very closely with Strawberries. Favorite fruit: strawberries! There are lots of things I say frequently without being aware of it....until they show up in my kids' speech. My two year old tacked "or something" onto a lot of what she said and I realized it was from me! I love pineapples, ya know? My favorite fruit is strawberries, when they're in season. I also love apples-my grandparents had an apple orchard when I was little, and fresh apples were the best. My favorite fruit is watermelon. Tastes like summer. my favorite fruit is cherries :) Thanks for the giveaway! My favorite saying is "Life is good", especially having a chance to win these pretty fabrics. I love Randi's blog. I appreciate all she shares. My favorite fruit is fresh strawberries, strawberries, strawberries. By fresh I mean still sunshine warm. I love picking them in the warm sun and sharing them right then and there with my children, nothing better. Don't think I have favourite phrase but I love fresh raspberries!! Thanks for the giveaway! 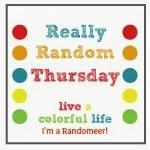 I do follow Randi's blog, its great! I don't have a phrase, but I do say a couple of words quite often: seriously, apparently, and actually. Favorite fruit is a toss up between Honeycrisp apples and red grapes! Apples are my favourite fruit and I have no idea what fuyu persimmons are so I'm off to find out! 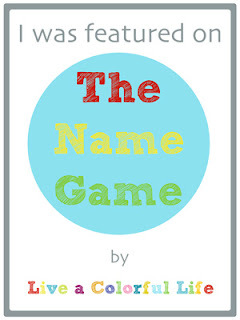 Thanks for another great 'name game'! A lot of sentences from me begin with: apparently and actually. I noticed when my 4-year-old started saying, "ACTually...."
My favourite fruit has to be oranges. Nice juicy navel oranges. Mmmm. Also, crispy tart apples. I love fresh strawberries in June and a crunchy fresh apple in fall. Mmmmm. I like to say, "Wonderful" in both an excited way and also sarcastically ie when my kids do something terrible. My favorite is a fresh, juicy peach. Thanks for the giveaway! Great giveaway! My favourite fruit is fresh local strawberries. Thanks! This was a fun post to read. I also shop with Randi and I love her blog so it was fun to read about how she got started. My favorite fruit is mango. Especially freeze fried. Such a sweet delicious snack. My favourite fruit is cherries. Love 'em. Thanks for a great giveaway. My favorite fruit is different depending on the season. Right now ... fall ... Honeycrisp apples hands down. Although I just at pineapple for dinner and it was wonderful. My favorite fruit are apples... Granny Smith, to be precise! I know I say "Let's Skidaddle" when it's time to leave, since I hear my 3 year old saying the very same thing to me when it's time for me to drop her off at school. Thanks for the great giveaway!! My favourite fruit is a juicy nectarine. There is something about it that is so much better than a peach! I had to laugh at your "here's the thing" because I always say "the thing is..."
I love fresh pineapple, but not many other fruits. My all time favorite fruit is mangoes like they grow them in Australia. I've never eaten a better, bigger mango than those they grow in Aus. But since I don't live in Aus, I settle for grapes in the US. Thanks for the chance to win this giveaway. Gotta love fabric! I realized that I say actually a lot once my kids started talking and said actually a lot too! Thanks for the chance to win some Ruby...I really like it...and my fav fruit is raspberries (are you surprised?). It's a toss up between fresh cherries and mandarin oranges. Both have particular seasons so aren't everyday treats. My favorite fruit is Honeycrisp apples -- love them!! I enjoyed the post about Randi ! Thanks for the give-away!! My favourite fruit is star fruit but it's hard to find here! Since I'm Norwegian 'Uff Da' is my inherited expression. I follow Randi's blog so it was fun to read your post about her. The phrase I use all the time..."it could always be worse". That helped me get through tough times years ago, and I still use it. Great giveaway. Something I say alot. Hmmm, can't think of one so I guess I'll go with my favorite fruit. Cherries, definitely, cherries. I love raspberries and also strawberries. Thanks for the Ruby giveaway, would love to win. Raspberries have always been my favorite! I have a black raspberry pie for my birthday every year! "There's always hope!" is something I say often and I have a blog by that name except I just added "Remember" to it because I have to remind myself often that there IS always hope! My favourite fruit is raspberries - from our garden! And I love Randi's blog and her shop. Thanks for sharing! My favorite fruit is pineapple. It hanks for the giveaway. Favorite saying "Jesus, Mary & Joseph" When you say that, it is a blessing rather than a curse. And favorite fruit is hands down nectarines. My kids say that right before I'm about to fuss at them for something I say, "I love you but..." and then I start laying into them! Thanks for the chance to win!